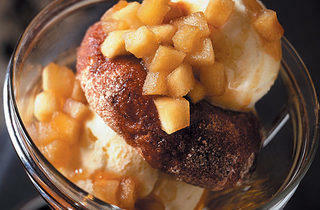 Contrary to basic human behavior, Landmark’s pastry chef Elizabeth Dahl isn’t a big doughnut fan. But having grown up in the rural Midwest, she does make an exception for the cider doughnuts that are so ubiquitous at apple orchards. 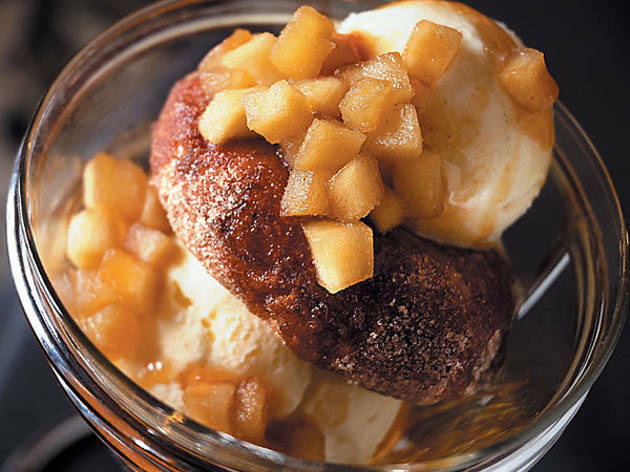 Of course, the deep-fried rings alone won’t cut it, so she creates a cider doughnut sundae by topping the cakey, sugar-dusted pastries with vanilla gelato, sautéed apples and a drizzle of caramelly cider reduction. 1633 N Halsted St (312-587-1600). Doughnuts are a regular indulgence for Seasons pastry chef Scott Gerken: If he’s not making them for his diners, he’s making them for his crew to snack on during breaks. His latest doughnut creation: beignetlike chocolate doughnuts (each one stuffed with 58 percent cocoa dark chocolate that melts during the frying process). They’re rolled in cinnamon sugar and served alongside a chocolate pot de crème topped with coffee mousse and coffee granita. Four Seasons Hotel, 120 E Delaware Pl (312-649-2349). “Doughnuts in this country are a big thing, you know?” So says pastry chef Fabrice Bouet (in a thick French accent, no less). Yet for the Palmer House’s new restaurant Lockwood, Bouet is making them with a decidedly European flair: His Italian-style coffee and doughnuts features an espresso panna cotta and bombolini—fluffy, round doughnuts that come in three varieties (filled with raspberry, lemon or Nutella). 17 E Monroe St (312-917-3404).